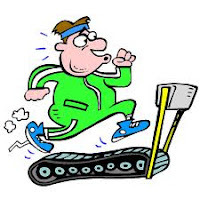 Racquel Writes: Exercise: It Does a Writer Good! Exercise: It Does a Writer Good! Hi all! T.G.I.F. Enough said, right? What a week it's been! I hope yours was less stressful than mine. Yesterday was so stressful that I thought I'd hit the gym to clear my mind. I tweeted, "Going to take my frustrations with today out on the gym. Plus, it does a writer good." I thought, "Hey, why don't I write a post on the benefits of exercise to writers?" We make so many excuses. We don't have time, we're tired, we just don't feel like it, blah, blah, blah. Not only is exercise good for your health, but it's good for your mind and your writing. Here's why. 1. You can think while you exercise. Picture yourself pumping away on the elliptical machine. It's a kind of movement that's mindless and doesn't require your full attention. Start thinking about that novel or short story. Was there a problem with a character or a glitch in the plot? Well, it may suddenly start making sense. If you keep exercising you'll start to find that your fiction problems can be solved and they sort of just fix themselves. All you needed was time to think. In a way, when you're exercising you're forced to be alone with your thoughts. If you're on one of the cardio machines, most of them have a spot where you can rest a book or magazine. Why not bring the latest copy of Writer's Digest with you? How about that novel you've been reading for two weeks? Another good idea might be to listen to writing or reading related material on your iPod. You can listen to a book or a podcast on writing. I used to listen to "Three Chicks on Lit," on Blog Talk Radio, while I ran around the neighborhood. Ever have Writer's block? Well, for me, there's nothing like a good run to help clear up some of the clutter in my mind. They say that exercising releases "feel good" endorphins. Have you heard of the runner's high? It really does exist. It's that euphoric feeling you get after endorphins are released. Wouldn't you love to sit down at your desk and begin to tackle your novel in that state of mind? Exercising is good for both the body and the brain. Whenever I'm stuck on something in my writing, or when I get a rejection, I like to hit the gym. It never fails me. I always come back to my desk refreshed and ready to write. I agree with each thing here. If I'm stuck on something, I'll usually go for a walk and when I go to the gym, I always read on the bike. I totally agree. Exercise is great for writing. I especially like multi-tasking and thinking about my book as I jog.